Last week, I finally got to answer the "Who" questions, and today, I finish up this mega-series with the "Where" questions. As this has been ten years in the making, let's get to the questions and finish up this series. Every planeswalker in the teaser that shows up in a stained-glass window (all 36 of them!) appears on their own unique planeswalker card in War of the Spark. You heard me correctly, all 36! I've been talking on social media about how War of the Spark is a very different set. This should start giving you a clue that I wasn't kidding. What does this mean for the set? What changes will it require? How did we pull it off? You'll have to wait and see. It was a big puzzle for R&D to solve, but we did it and created a fun and balanced set to play in both Limited and Constructed that I'm excited for you all to experience. Xenagos is dead. He died in Journey into Nyx, and sadly, he died in Nyx, meaning he isn't even in the Theros underworld (unlike a certain white-aligned knight). So, Xenagos isn't anywhere. He's gone, and thus, is one of a handful of Planeswalkers not in War of the Spark. While most of the known, living Planeswalkers are in War of the Spark, not all of them are, Garruk being one of the absent Planeswalkers. But fear not, Garruk fans, we have plans for Garruk. You'll be seeing him soon enough. In today's information gathering, I'm interested to hear what planes you want to visit in an upcoming Standard-legal set. Here's how I would like you to respond. Please list, in order, your favorites from one up to five. You can list less than five, but please restrict yourself to five answers. Number 1 should be the plane you most want to see us visit in the future. If you're interested, you may also tell me why you want to return to that plane. You can list any known plane including ones we've never visited before. I need names of existing planes though and not "wild west plane." Fiora – I love Conspiracy and would like to see Fiora in a Standard-legal set. Tarkir – Go back, but there better be clans. Rath – I don't know how you'd do it, but I'd love it. Alara – More Esper please. I would love to get a lot of data, so please pass this along to your Magic friends to answer as well. Please number your answers as the data will be weighted. I will count them in the order listed if you don't number them. Please don't list the same plane more than once. I linked to this question from all my social media accounts and got a few other links from places like Reddit. (For people that couldn't respond on Tumblr, I let them email me, and all those answers were counted.) I got a lot of responses, and I'd like now to share the data with all of you. Three quick points before I do. My social media audience is heavily skewed toward the more enfranchised players. If we did a larger poll of Magic players through market research, it would probably look a bit different than this. I asked each person to list up to five planes in order of preference. The following data is weighted (5 points for a first pick, 4 for a second, and so on). I asked this question in January as Ravnica Allegiance was coming out. It was clear having visited a plane recently lowered responses for an asked return. If I asked this same question in three years, I assume it would shake up the answers a bit. We've spent a lot of time over the years digging into the nuances of each color (you can read about much of it here), but the essence of what the colors represent philosophically has been one of the most consistent elements of the game. So, where are the philosophies trending? The same place they always have. The thing that does change is that we are constantly re-evaluating how we execute those philosophies through mechanics. In just the last year, for example, we've made green secondary in haste and black secondary in flash. We're always looking for opportunities to push in new directions, especially in certain colors in certain formats (red and white in Commander is a good example). The color pie ebbs and flows, but the philosophical foundation remains sturdy. He's still totally lost. He did show up in a piece of art in Guilds of Ravnica . . .
. . . and Ravnica Allegiance . . .
. . . so, I'd keep an eye out for him in War of the Spark. Oh, and if you find him, please tell Humongulus. After War of the Spark is Core Set 2020. Then in October, we're going to be visiting a brand-new plane. I can't tell you anything about it yet as we're a little too far out from it, but I can say it's a set I've been trying to get us to do for over a decade, and I'm really excited about how it turned out. 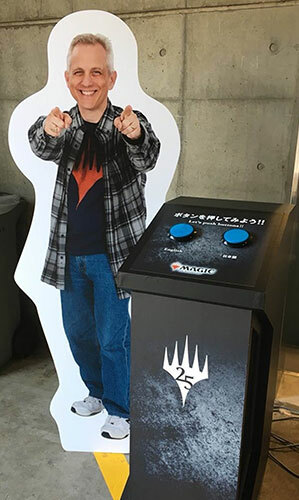 Commander planeswalkers, lore-centric or otherwise, are solely the domain of the Commander decks, and even then, aren't something we do every year. We have been trying to infuse our supplemental products and relevant Standard-legal ones (liked Dominaria and Core Set 2019) with more lore-centric cards. For example, Modern Horizons is chockful of references to Magic's past, both in creative and mechanics. The secret is to look in different places for different sets. For example, whenever we do a top-down-inspired design, we do a lot of research into the original source material to find out all the cool things that we may not be aware of. I also like to look at pop culture to see how other people have handled the source in question. For other sets, we like to try starting from a place that we've never started a set before. Khans of Tarkir began with us trying to flavorfully capture a unique way to draft the block. Ravnica came about because we were trying to be a multicolor set that was as different from Invasion block as possible. Kaladesh was us trying to capture the feel of being an inventor. One of the most important parts of any set I design is to start by coming up with a unique way to think of the set, which gets my mind and my team's minds racing. That general strategy gets us our best inspirations. We don't know. Here's the little we do know: Volrath visited an as-yet-unidentified plane and discovered slivers. A fellow shapeshifter, he was so fascinated by these mesomorphic, hive-minded creatures that he brought the Sliver Queen to Rath. He then took a bunch of her brood away from her (and stuck them in the Furnace of Rath) so he could study them. The Metallic Sliver was designed as a tool to spy on the sliver hive. That's why it gets abilities but doesn't grant any. The slivers got to Dominaria when Rath was overlaid onto it. There's also a different breed of slivers (the humanoid looking ones) on the plane of Shandalar. We don't know whether the two different breeds of slivers are connected to one another. Will we ever visit the sliver home world? Hopefully, one day. Every time I look back ten years, I'm always happy to see how much design technology has improved and expanded. There are always things that I know would have surprised the ten-years-younger me. So, when I look forward ten years, I hope for the same thing. I want Magic to continue to grow and evolve often in ways I might not be able predict right now. I do the majority of my card designs at work, either sitting at my desk or creating cards in meetings with my Design team. I do the majority of my "big picture" work—crafting how the set is coming together or creating mechanics or larger themes—when I'm busy doing other things, often out of the office. We'll talk through ideas in meetings, and then I let it percolate in the back of my head. Some of my best ideas have come about when I was busy doing other things. I created the entwine mechanic (from original Mirrodin), for example, in a dream. The current answer is nowhere. When the Mending occurred (during Time Spiral block) it shut down all the existing planar portals. The only working portal we've seen since the Mending is the Planar Bridge invented by Rashmi on Kaladesh, and it was only capable of transporting inorganic material. Where did it go before the Mending? No one knows for sure, but I've heard rumors that it was some kind of college. I think a community college somewhere on Dominaria. It's just rumors, though. Like the slivers, it's not yet a known world. The one thing we do know is that they've showed up on various worlds, the original Phyrexia, Dominaria, Mirrodin, Elspeth's home world. Pre-Mending, they used planar portals, but now that those have shut down, their ability to move to new planes has been greatly halted. They managed to make it to Mirrodin through an unaware, infected Karn. Like the slivers, there's a decent chance we'll one day visit their home world, or possibly just another world they exist on. The plane I'd be most excited to visit is Kaladesh. I think the plane is beautiful, and I'd be fascinated with the technology. Also, it's not overrunning with disasters that might endanger me. My runner-up is probably Ravnica. One of the issues with Ravnica is there are a lot of demands for legendary creature cards. So much so, that Ravnica is the plane with the second highest (behind Dominaria) amount of named, known characters without a card. Between returns to Ravnica and supplemental sets, we've been working to slowly catch up. I believe we'll eventually print a card for Feather, but you need to be patient. There are a lot of cardless Ravnican characters to get to. I've been told he's off roaming the Rubblebelt after losing a fight with Domri for control of the Gruul. I'm pretty sure we'll see him again. Wow, that's a hard one. I've done a lot of traveling over the years. Okay, I'm going to pick one per continent. Okay, not a lot of competition with this one as it was my only trip to Africa, but I had a wonderful time. I got to witness the largest gathering of wild penguins I've ever seen, I pet a cheetah, and I bought a lot of cool art that's still in my home. This is the one continent I haven't been able to visit while working at Wizards. There has been organized play on the continent (a group of scientists ran an Arena season way back when), but no game stores as of yet. But if Grand Prix Antarctica ever happens, I'm in. I believe Tokyo is the foreign city I've visited the most for Magic events. Every visit has been a pleasure. Trading card games are very popular in Japan, and they have the politest player base I've ever met. I haven't had a chance to visit Japan for a number of years, but last year I was able to send a few standees in my place. If you pushed the first button, I spoke in English, and if you pushed the second, I spoke in Japanese (with a lot of coaching from a translator). I've promised my wife one day I'll take her to Japan, so a return trip is just a matter of time. Before the Magic Invitational, my wife Lora and my then six-month-old daughter Rachel had a week's vacation and loved it. This is where I got a hat that I wore for ages (before an airline lost our luggage) and another batch of art we have in our home. This was the hardest one to choose, as I've visited a lot of European cities in my time at Wizards and I've had a wonderful time in so many of them. I chose Venice as there was just something magical (pun intentional) about that trip that I enjoyed greatly. I also managed to eat pizza for every meal. This was another tough pick as I've had the pleasure to travel to a lot of American cities, but so many different Magic historical events (including the first Pro Tour) have happened in the Big Apple, it had to be my choice. The Rio Invitational was an amazing event, but this site gets the win as it's where I asked my wife to marry me, so it's a sentimental pick. Also, Rio was breathtakingly beautiful (although quite hot). One of the things I'll remember most from my Magic days was all the traveling I got to do. So many wonderful cities to experience and amazing fans to meet. Tabletop Magic (the term we use for "paper Magic") is at the very heart of the game. In this day and age of people staring at screens, the fact that Magic is a game you can play face to face with another individual is a key part of its identity. Yes, we have a lot of exciting plans for digital Magic, but that doesn't mean we have any plans of abandoning or even lessening tabletop Magic. In fact, we believe expanding further into the digital realm is going to grow our tabletop business as we get to expose more and more people to the excitement of Magic. Where do we expect to be in five years? We see Magic being bigger and more wide-reaching with an ever-larger base of fans, many of those playing tabletop. While I can't reveal anything just yet, there are numerous plans afoot to do cool and new things with tabletop Magic specifically. Five years from now, I expect tabletop Magic to be the largest and most robust it's ever been. That's all the time I have for today. Thank you to everyone who took time to send in a question. I'm happy to finally bring this mega series to a close. As always, I'm eager to hear any feedback on this column or any answers I gave today. You can email me or contact me through any of my social media accounts (Twitter, Tumblr, Google+, and Instagram). Join me next week when I go a little deeper on the topic of resonance. Until then, may you have fun exploring—both the Multiverse and the globe.